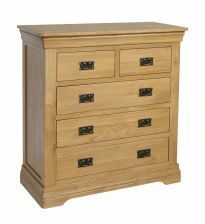 The Farmhouse Country Oak 2 over 3 chest of drawers is a very attractive item of bedroom furniture made exclusively for Top Furniture. Delivered FULLY ASSEMBLED. 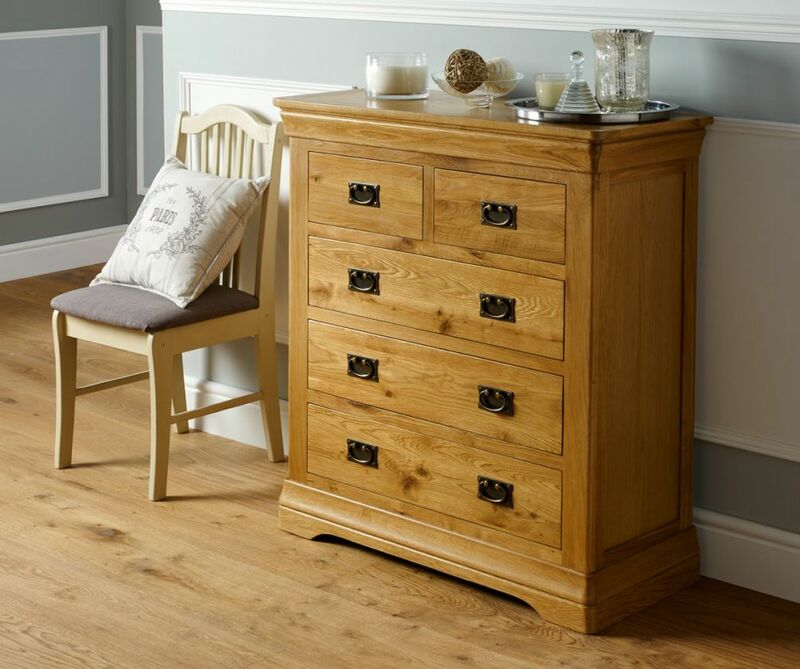 Hand finished by expert joiners with an oiled wax finish which is extremely durable and shows of the gorgeous grain of the sustainable American oak. 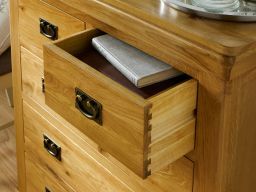 All drawers come with hand made dovetail joints for added strength. Lowest UK price guaranteed. Dimensions: W 955 x D 415 x H 1030 (mm) - Available to view in our Uttoxeter, Staffordshire warehouse showroom. Well made item. I am pleased with my purchase. Beautiful dresser. 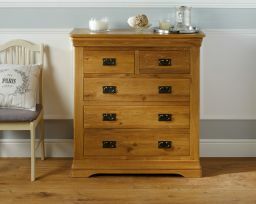 Well made, solid oak, nice honey colour, large drawers. Packaged very well and delivery was quick and easy. Friendly staff and delivery drivers. Beautiful quality. So happy with these. 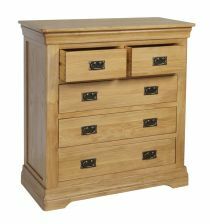 Very solid chest of drawers, looks good in the bedroom. I purchased two of the Farmhouse Country Oak 2 over 3 Chest of Drawers, really quite pleased with them. Great value and built to a high standard, solid and of a classic design. The waxing of the wood brings out the grain and just adds to the look. The delivery guys were very helpful and friendly also. Great product and the service and delivery from Top Furniture was superb. Beautiful piece of real oak furniture. Just what we had been looking for. Well made and sturdy. From ordering to delivery the process has been smooth, professional and helpful. The two delivery drivers were very friendly and helpful. The furniture is excellent too and looks really good. Thank you! Great furniture- drawers smaller then expected. Dimensions on website are of the overall measurements of piece of furniture- there should be the actual drawer sizes as this is deceiving. Good quality overall. Well packaged. After trolling most of the Oak Furniture shops and websites in England i stumbled across the Top Furniture website and i was a little sceptical of the prices and quality they were quoting,so me and the Mrs made a 1 1/2 hour trip to the Uttoxeter showroom just to have a look at the quality before we committed to buying,well it was a unnecessary trip because the price and quality are amazing. We bought. Farmhouse Country Oak Double Bed 4ft 6 inches Farmhouse Country Oak 2 Over 3 Chest of Drawers 2 Farmhouse Country Oak Bedside Tables Farmhouse Country Oak Storage Blanket Box And saved about £500 on what some of the High Street retailers were wanting to charge us,also the delivery men were very helpful and the furniture was really well packed. I can't recommend Top Furniture highly enough and if you're thinking of making a 3 hour round trip,save yourself the time and petrol money!!! A Stunning piece of furniture.Very well made, with great wood grain. Looks superb. Extremely pleased. Service, delivery and quality all 5 star. Will definitely recommend to others and use again in the future. The design of this range is the best I could find anywhere online at any price, the bottom plinth in particular and the rounded finished corners give it a superior look to any of the competitors which tend to have a more basic and block like appearance. The external finish and the general aesthetics are very good, the drawer interiors are of a lower quality wood and handles could be better but both are very functional and price was of the lowest on the market at the time (Sept16) Overall, excellent styling, aesthetically pleasing, very good external finish, functionally good and therefore very good value for money. Delivery and pre-sales communication were first class with good follow up customer service. Very satisfied and happy to recommend this supplier.